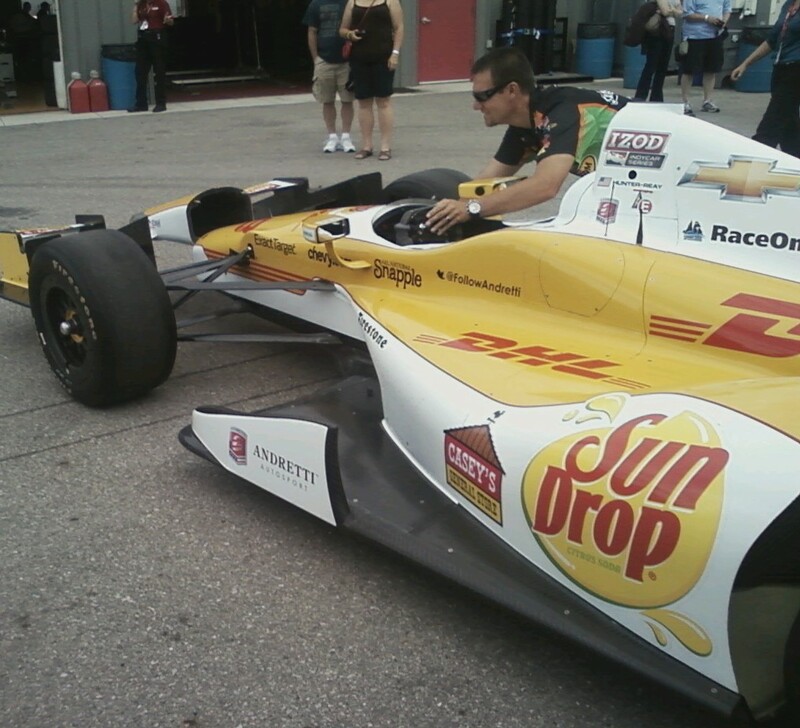 Two wins in a row for Andretti Autosport driver Ryan Hunter-Reay (photo above) with a win in front of a big crowd (photo below) at Iowa Speedway for the Iowa Corn 250. The race did not begin until 9:40pm (cental) due to a series of thunder storms passing through Newton IA. A very unusual start to the race as pole sitter and two time Iowa Speedway winner Dario Franchitti did not complete a lap as mechanical problems forced him out and Alex Tagliani spun before the green flag flew. Helio Castroneves lead a lot of laps and was the fast car for much of the race but faded during the last fuel run. Will Power and E.J. Viso had contact in a tricky corner number two taking both drivers to the garage. JR Hildebrand and James Hinchcliff hit the wall hard in seperate incidents ending their nights early. Hinchcliff had a good run going, being very aggressive and taking the lead on lap 50. Ryan Briscoe and Josef Newgarden also dropped from the race due to contact in front of a near capacity crowd. Scott Dixon had the lead during a caution with 60 laps to go followed by Marco Andretti, Castroneves and Ryan Hunter-Reay. The Dixon and Castroneves cars both struggled after the restart with team mates Andretti taking the lead and then quickly passed by Hunter-Reay for the top spot with 13 laps to go. Tony Kanann snuck onto the podium after spending most of the day recovering from a poor qualifying effort. The Firestone Indy Lights race scheduled for a 6:40pm start was pushed back until after the Indy Car race. Pole sitter Tristan Vautier lead much of the race but was penalized for blocking and lost the lead. His teammate Esteban Guerrieri then held off Gustavo Yacaman for the win. 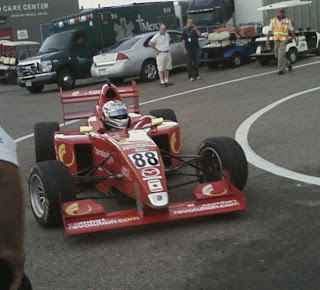 The Star Mazda race was won by Sage Karam (photo above) as he scored his first win of the year, followed by Martin Scuncio and Conner De Phillippi. Front runner Jack Hawksworth crashed in turn four and did not finish. Check our Twitter feed (right side of this page) and search "Speedtalk on 1360 fans" on Facebook for full photo galleries of this event. 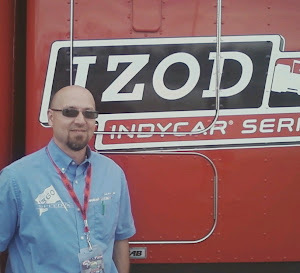 The Indy Cars are at Iowa Speedway in Newton IA. A very unique qualifying format saw Dario Franchitti win his heat race and putting his #10 Target car on the pole for the Saturday night race. The other two heat races were won by Graham Rahal and Tony Kannan (above). 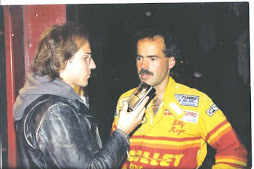 Friday night saw Bobby Santos win in the USAC Midget division and Bobby East (above) win in the USAC Silver Crown cars. The Iowa Corn Indy 250 is set to take the green flag at 9 PM (Central). The race will be shown LIVE on the NBC Sports network. 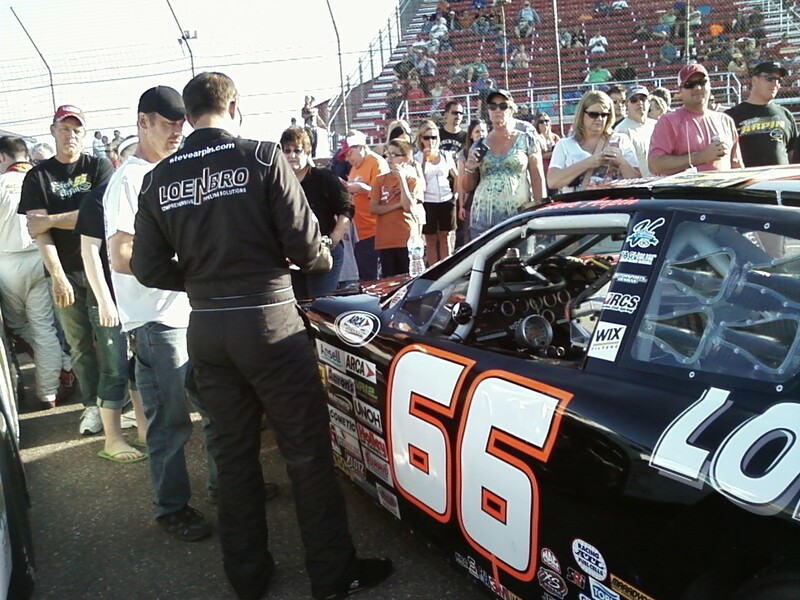 Steve Arpin has had great success in every form of racing, from being the Modified WISSOTA 100 champ at the age of 18, to scoring three wins in the ARCA series. 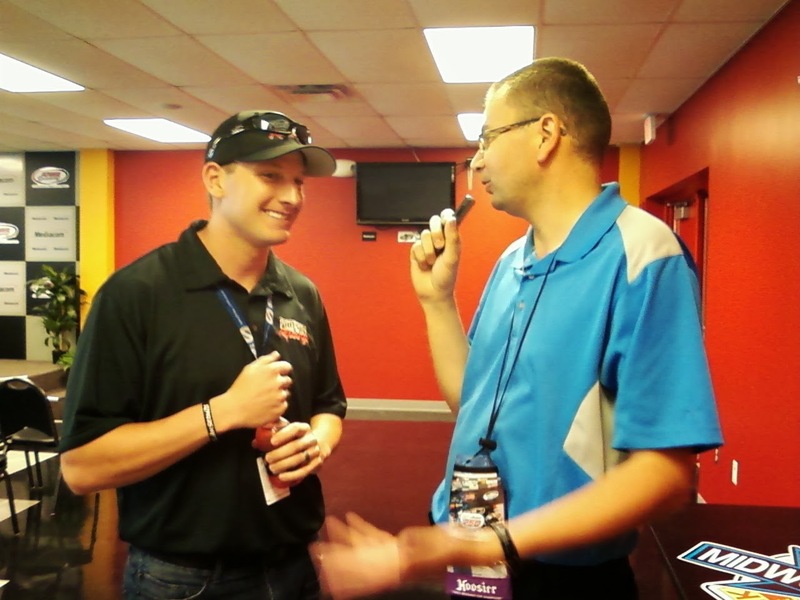 He is now competing against some of the best drivers in the world in the upper levels of NASCAR. Competing on the track and for a limited number of good rides. In this economy being an exceptional driver is not good enough, you need a little extra something to stand out in the crowd. Maybe his advantage will be the fabled Minnesota nice. 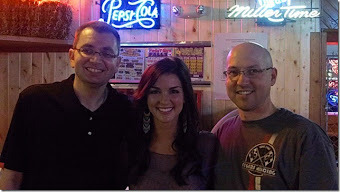 Steve is not exactly from MN, his hometown is Fort Frances Ontario Canada, just across the border from International Falls but he is the perfect example of Minnesota nice. 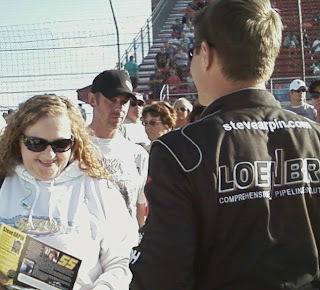 Arpin's personality and attitude that is hard to miss, he is great with fans and has a smile that seems impossible to fake. Just think of the exact opposite to Kurt Busch. 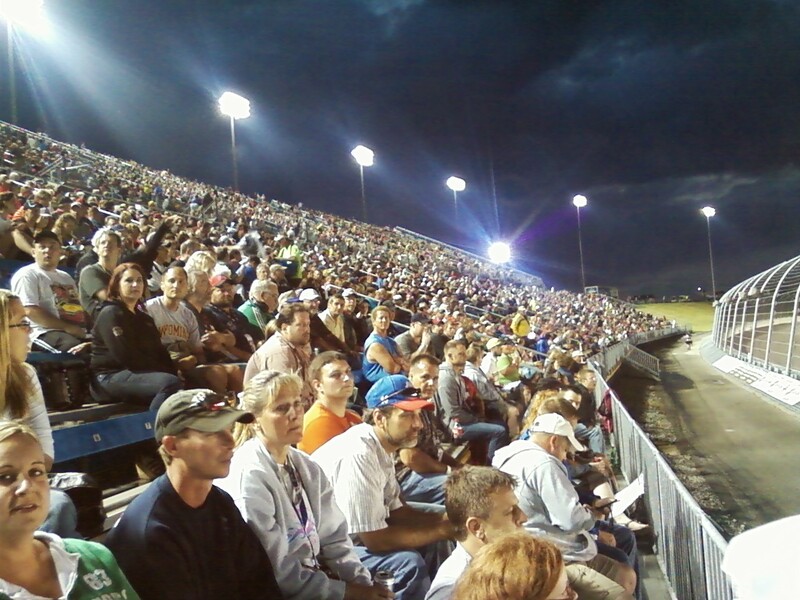 Steve finished one lap down in 12th place at the ARCA race in front of a real good crowd at Elko Speedway (photo above) on Saturday night June 2nd. He jumped from the car laughed and said "I have never been so busy in a car as I was tonight, the car was swearing at me the last 60 laps, I don't know where I finished but that was a blast!" 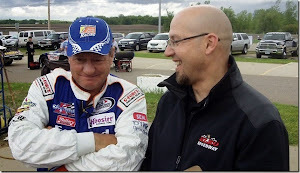 Arpin had nothing but good things to say about ARCA. "This series is like a big happy family, every driver who is here has aspirations to move to the next level, this was the first type of asphalt racing I did back in 2009," said Arpin "I have had so many opportunities and been able to live a big part of my dreams due to what I learned in ARCA." 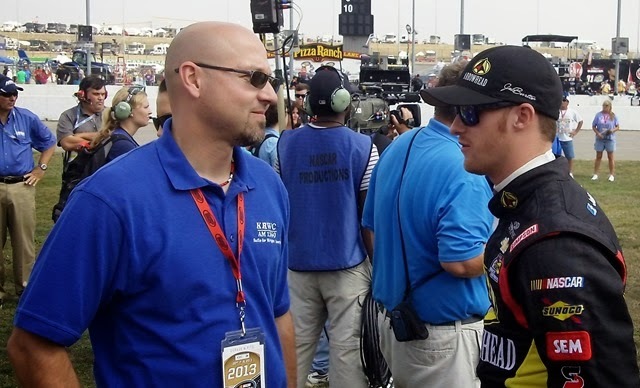 In the last couple years Steve has raced in 14 events in either NASCAR Nationwide or Trucks scoring two "top 10" finishes and a pole in Chicago. 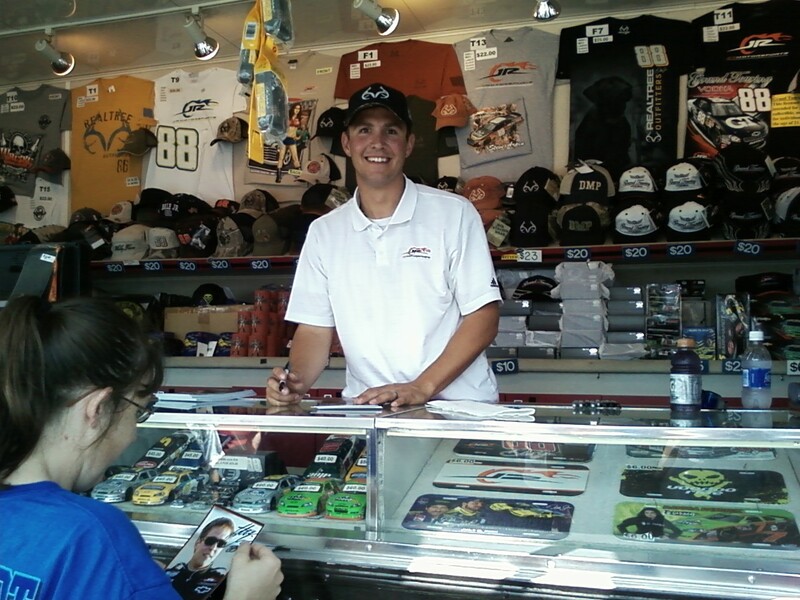 He signed autographs at Iowa Speedway (photo below) when driving for JR motorsports. That big opportunity has yet to emerge but Arpin is optimistic that it will happen. 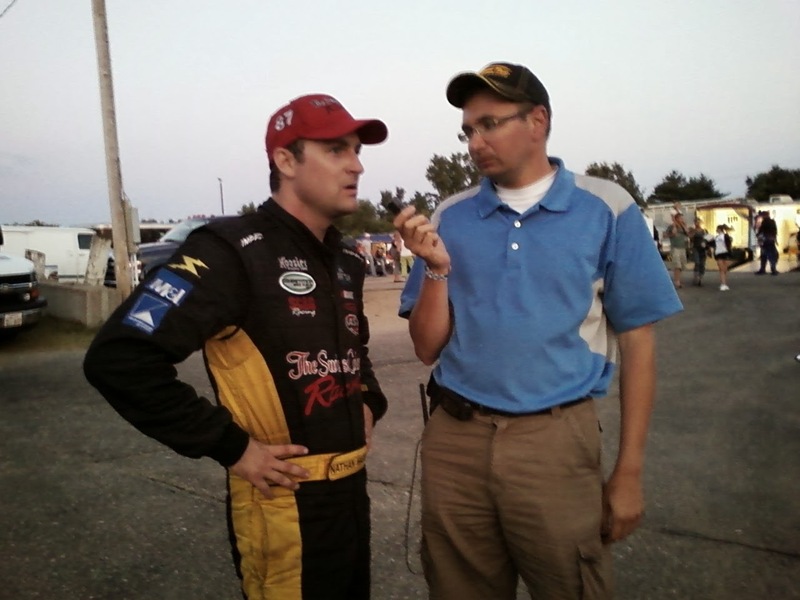 "We have some great things in the works," said Arpin "I know we will be racing both the dirt ARCA races this year, I think we will be down in Daytona in July and other stuff we can't talk about yet." 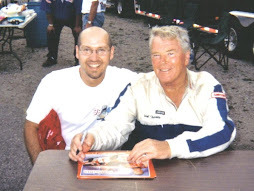 Arpin loves this area, lived in Rochester, and has raced many of our local dirt tracks. 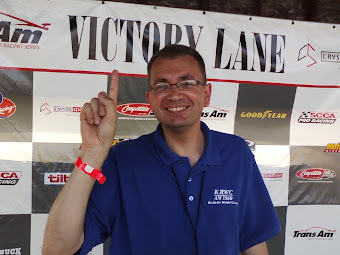 In fact, they plan on racing the Gopher 50 at Deer Creek on Saturday July 7th "You will never get me out of a dirt car, its way too much fun!" 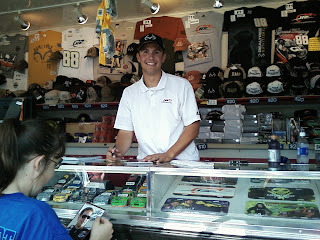 I think NASCAR could use a driver with a good dose of Minnesota nice. 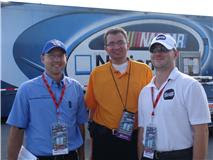 The first ever ARCA race in the state of Minnesota was a big hit for racefans who came out in force on this beautiful day in early June. The Akona 200 started with Alex Bowman on the pole, he quickly surrendered the lead to Matt Lofton and then #25 Brennan Poole (photo above) took over the top spot on lap 12. 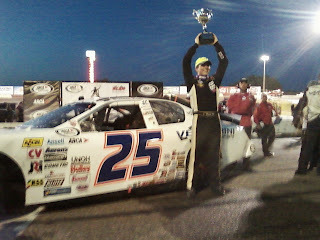 Poole seemed to be the quickest car on the track the entire race. 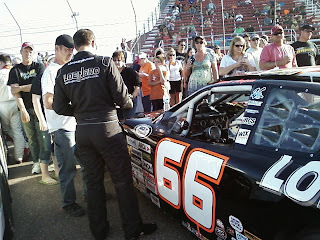 Lofton, Frank Kimmel and Buescher took the opportunity to pit during an early caution on lap 66. 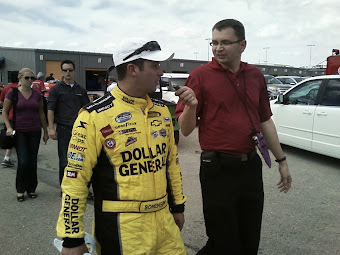 Poole stayed out and only lost the lead during a pit sequence when on lap 90 MN native Joey Miller spun and his Venturini team serviced the car, he returned to the track in the 8th position behind cars who had pitted on an earlier caution. On lap 117 crowd favorite #66 Steve Arpin (photo above) spun bringing out a caution and Poole had worked his way to fourth and all the cars in front of him had tires 24 laps older than his, giving him a slight advantage. Poole then worked the high side through lapped traffic to take back the lead on lap 133, a lead he would never let go of. Matt Lofton had an impressive run, getting past Buescher and Kimmel in the last 25 laps to score a second place finish. It was a dogfight for the next few positions, drivers went three wide numerous times with a bit of contact to thrill the crowd at the finish line. Chris Buescher got third, followed by Frank Kimmel who had the oldest tires at the end and a hard charging Tom Hessert in fifth and hometown boy Joey Miller fighting back for sixth place. Eleven cars finished on the lead lap with long-time Minnesota dirt track star Steve Arpin the first car one lap down. Mason Mingus who drives for MN race team Win-Tron racing finished in 9th position.